Something as simple as a brochure holder can make a big difference in your in-store sales. When a potential customer takes a brochure home, it can spur a purchase decision and provide the impetus for closing a deal. 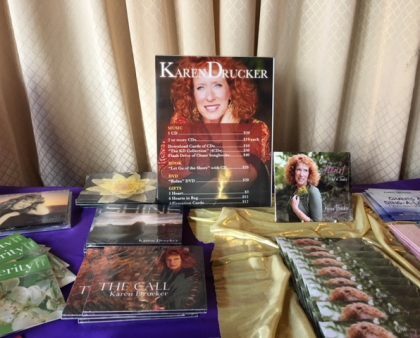 Brochures can help you move your high-end merchandise and services because they serve as portable reminders of your offerings. They give your prospects the information and the reminder they need to contemplate their purchase decision. 1. Place brochure holders on accessible countertops. 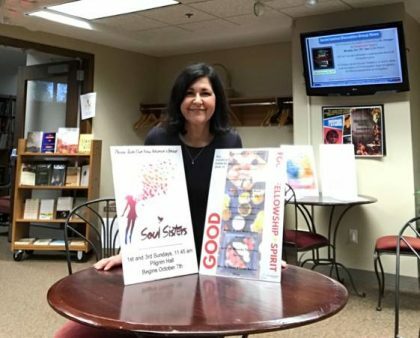 Brochure holders on your store’s countertops place your promotional materials in front of customers who often stop and scan counters during their shopping journey. Strategically designed countertops can invite visitors to pause and contemplate display items. While browsing, they will take more time to notice your brochure holder stands and their content, and the items on display. This provides an especially effective opportunity to promote high-margin merchandise. To make sure that your customers see your countertop print materials at their best, take advantage of Hutchco literature holders and brochure display stands that come in two different sizes: 8 ½ x 11 and 11 x 14. Both come with peel-and-stick pockets for either inboard or outboard placement. 2. 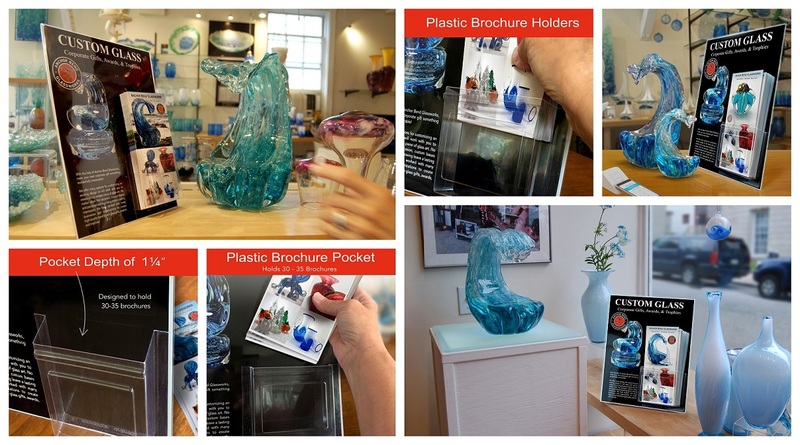 Place brochure holders close to sale items and exhibits. In-store sale items and exhibits attract the attention of shoppers who associate them with value. By locating brochure stands nearby, you can help shoppers associate high-end services or products with high-value items they already recognize. Research from the fashion industry, for example, shows that consumers tend to perceive the value of items by affiliating them with nearby brands. That’s why promotional brochure holders, with brand information, placed near items of known value, can help upsell your high-margin products. 3. Promote loyalty programs with brochure display stands. If your business deals in a product or service that customers buy repeatedly, creating a customer loyalty program can encourage them to buy from your business rather than from the competition. Some businesses, for example, offer a discount when customers prepay a month’s supply of a consumable, such as water refills or pet food. Others may offer free delivery to your office as a repeat customer. You can promote your loyalty program by placing a brochure display stand on a counter or near the checkout. Your brochure can explain the terms and conditions of the program and how participants can maximize savings through continued allegiance. Special deals for loyal customers can help put your business above the competition and encourage brand devotion. 4. Brochure holders can promote offers, deals, and discounts. You can promote your best offers, deals, and discounts by placing brochure holders near the store entrance. Store foyers provide high-visibility space for print materials promoting items in your store. A brochure holder stand right next to the door or near shopping baskets can get promotional materials in customers’ hands while they are thinking about similar purchases. 5. List your website, phone, and address on print materials. You can include your business website, address, and phone number in a brochure to open up new shopping venues for potential customers. Brick-and-mortar shoppers can learn about your online offerings. If you sell your product or service via phone contact, you already know the importance of listing your phone number. Even if your business handles customer orders by phone on rare occasions, including the number may help customers with questions and provide a way for less-technical shoppers to get in touch. 6. Brochure holders can help upsell high-end items. Brochures make an excellent medium for promoting high-end products and services. Having the right brochure holder and well-designed print materials are especially important for upselling customers. Hutchco can help you select the perfect brochure holders to provide the best presentation for your high-end products. Our brochure holder combinations allow you flexibility in your design. Your brochures and display should appeal to the emotions, featuring exciting or touching images and appropriate colors. Avoid unnecessary jargon and prices to keep the reader focused on the emotional components of the sale. 7. Launch new products or services on brochure display stands. A brochure display stand can introduce your customers to your new products or services. A brochure for a product launch should sell the idea to prospects. They may not yet know enough about your product or service to understand exactly how it can help them. Your brochure can fill in the gaps, appealing to their emotions with effective images and engaging words. Try these ways to use brochure display stands in your store and see if it makes a difference in the dynamics of shoppers on your sales floor. Focus on your high-end, high-margin products and services, and remember that the brochure that leaves your store in the hands of your customers can and will work for you.